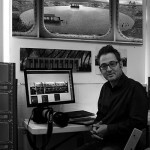 I have been an architectural photographer all my working life. Places and spaces interest and fascinate me . My work explores both the power of the single image and the rhythm and opportunity achieved through constructed images. Lately I ahve been exploring film. My project work on Hitler’s Atlantic Wall has taken me to the coastline of Northern Europe to capture these concrete crumbling behemoths while exploring their strong sense of time and place through their natural settings. I am especially intrigued by the way that the force of nature has undermined these brutal Blockhouses over the last 75 years leaving them softened and absorbed into their coastal landscape. My ‘imaginary places’ series has enabled me to express my fascination with both architecture and image-making in camera and in computer via repetition and reconstruction. The initial challenge is to find a space or place that resonates beyond its immediate 3 dimensional form . The manner in which the environment speaks to me, informs my artistic expression going forward. Having considered this carefully, and only over several days, do I start taking photographs in great detail and numbers. Generally, I now use high-end digital cameras or 35mm hand-held cameras. Armed with my photographs, I start a lengthy review in the studio. This acts as a filtering process. Sometimes, if required and the opportunity presents itself, I will return to re-shoot. Slowly – and ever so rewardingly – the imagined place crystallises and I will move onto Photoshop to both build and create it. This represents the next and final stage in my artistic process. My imaginary places series explores the relationship with place and time. The addition of countless elements from other images to form the constructed images explores the inherent tension and visual opportunity that lies between a still single image and a movie. The format of these pieces further strengthens this exploration. I think by the very frenetic nature of our existences, the profundity of our surroundings does (quite understandably) pass us by. The very fact that viewers of my work are forced to reconcile the ‘real’ with the ‘constructed’ creates a tension .I like exploring the way viewers engage on multiple levels when trying to understand the “imagined” image. I explore this through repetition, light and humour until the artwork is a virtual movie; one based on the built environment only.